It's almost St. Patrick's Day and a lot of kids want to catch a leprechaun. My kids and I made an outdoor leprechaun trap which I wrote about here, but, if you'd rather make one inside, it's super easy and lots of fun! The not-so-good-news is that Leprechauns are notoriously sneaky. If you really want to catch a leprechaun, you must be creative and extremely lucky! 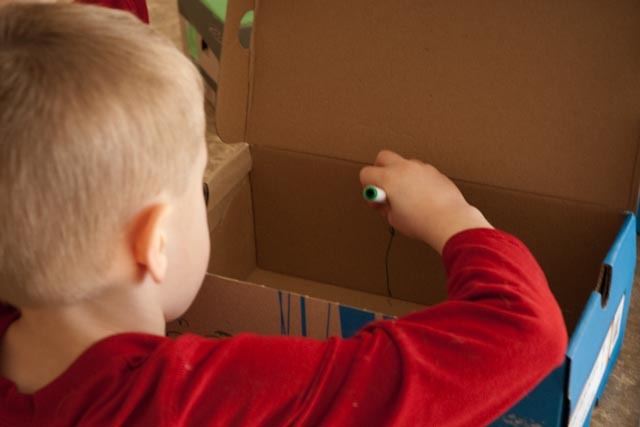 Have the kids grab an empty shoe box and their markers, crayons, stickers and glitter. It's legend that leprechauns like rainbows and gold, so the more colorful the trap is decorated, the better! Remember, four leaf clovers are supposed to be good luck, so the kids should draw a four leaf clover somewhere on their trap. Then, prop your lid open with a stick. And, put some coins, glitter or shimmery ribbon inside the trap to help attract the sneaky little leprechaun. Place it somewhere in the house where you think the leprechaun may find it, but don't make it too obvious. And, just in case you don't catch the leprechaun this year, the kids might enjoy seeing some evidence that the leprechaun was actually in your house (see this post for details).